According to the National Retail Federation, one in ten people dressed their pet up in a costume for Halloween last year. What were the most popular costumes? The devil and pumpkin. Most of us think of our pets as family members and will go all out to celebrate the holidays with them. Some people go out trick or treating with their pets and even take their dog or cat to a friends party to enjoy the festivities. 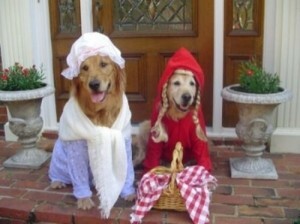 Today’s pet costumes are extremely popular. You can find them on just about every Halloween website. There’s a huge craze in pet costumes. In many ways picking out the perfect costume for your pet is much like picking out a costume for yourself or your children. Are you looking for ideas for a costume for your pet? Have a be careful with your pet this Halloween! This entry was posted on Friday, September 28th, 2012 at 7:44 pm	and is filed under Pet Supplies. You can follow any responses to this entry through the RSS 2.0 feed. You can skip to the end and leave a response. Pinging is currently not allowed.